Synopsis: In the tradition of Stephen King's "Salem's Lot", Cirque Du Freak is the frightening saga of a young boy whose visit to a mysterious freak show leads him on a journey into a dark world of vampires. Filled with grotesque creatures, murderous vampires, and a petrifying ending, Cirque Du Freak will chill, thrill and leave readers begging for more. 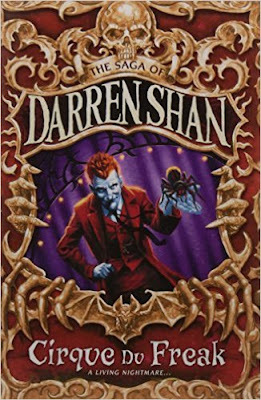 Review: This is the first book in the Cirque Du Freak series or the Darren Shan Saga. I bought all twelve of these books at a local charity shop. These books are sold for 99p and are on offer as buy one get one free which is an amazing deal even for pre-loved books. At some point in the near future I will be buying the boxset brand new and then I can donate all the pre-loved set back to the shop where I bought them. After picking up this book and starting to read it I found that, after a few pages, I was hooked on this book and just could not put it down. This was an amazing read and I would recommend it to anyone who enjoys young adult and paranormal books. I am a massive fan of Darren Shan and I plan to own all books by him.